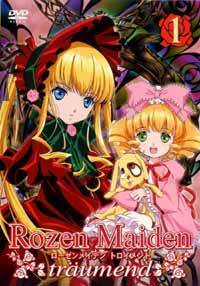 Notes: Immediate sequel to Rozen Maiden (see above duh), based off of the manga by Peach-pit. "Traumend" is German, and translates as "Dreaming". More than a seperate season, Traumend is the direct continuation of the Rozen Maiden series. So, if you haven't seen the original... GET OUT! GET OUT!!! GET OUT! Because, you see, you've already ruined the ending of the original by reading the synopsis, and I wouldn't want to ruin any more. Now that all of the n00bs have been scared off... Well, as I said- Traumend is far more of a continuation than a standalone product, and it shows. Whereas much of Rozen Maiden was based on introducing and developing the characters, Traumend starts off by shoving your face right into a big pile of action, and keeps it there for most of the rest of the series. There are still good old Suisei Seki vs. Hina Ichigo brawls, and Jun-kicking abounds; but Traumend is far more concerned with the drama and action than comedy. Much of the comedy is provided by the other new Rozen Maiden, Kanaria, the self-proclaimed 'most intelligent.' Who is, of course, a bumbling source of comic relief. While her ineptitude and enthusiasm are initially a bit grating, she eventually will worm her way into your heart... unless you didn't end up liking Hina Ichigo- but if that's the case, you've probably not made it this far into the review anyway. Despite the comic relief, Traumend is a far darker series than its predecessor. This ain't your daddy's Rozen Maiden, and these ain't the original series' fights. Dolls die, break, and sacrifice themselves. This is the Alice game in its full, frightening, form- and there can be only one survivor. Before anybody runs off, though, I'll say this- I'm not a fan of melodrama, and the series manages to steer away from it for the most part. The eliminations are handled with as little angst as can be expected. This serves as an excellent backdrop for further character development. Shinku's newfound vow to not fight, the bond between Suisei Seki and Sousei Seki, Jun's newfound maturity, and even Suigin Tou's (gasp) softer side... all of them are forced into the light by the conflict. The one caveat here is that the character development feels slightly forced in a few instances. But, overall, it's a nice complement to the more action-oriented focus of the series. The resolution to it all, though, is... well, it's a surprise. It's a road paved with a plot twist or three, and the end itself is one that you probably won't see coming. Unfortunately, the main reason you won't see it coming is because it's a good example of a deus ex machina. Still, even if you aren't willing to wait around for a third installment to the series, don't let that discourage you- it may not be the best ending, but the material leading up to it is exactly what the Rozen Maiden name would lead you to expect. Recommended Audience: This is a darker counterpart to the original series. Deaths abound, and younger audiences should be kept away.